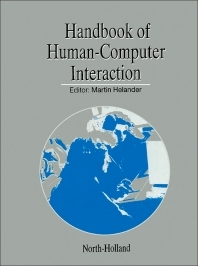 This Handbook is concerned with principles of human factors engineering for design of the human-computer interface. It has both academic and practical purposes; it summarizes the research and provides recommendations for how the information can be used by designers of computer systems. The articles are written primarily for the professional from another discipline who is seeking an understanding of human-computer interaction, and secondarily as a reference book for the professional in the area, and should particularly serve the following: computer scientists, human factors engineers, designers and design engineers, cognitive scientists and experimental psychologists, systems engineers, managers and executives working with systems development. The work consists of 52 chapters by 73 authors and is organized into seven sections. In the first section, the cognitive and information-processing aspects of HCI are summarized. The following group of papers deals with design principles for software and hardware. The third section is devoted to differences in performance between different users, and computer-aided training and principles for design of effective manuals. The next part presents important applications: text editors and systems for information retrieval, as well as issues in computer-aided engineering, drawing and design, and robotics. The fifth section introduces methods for designing the user interface. The following section examines those issues in the AI field that are currently of greatest interest to designers and human factors specialists, including such problems as natural language interface and methods for knowledge acquisition. The last section includes social aspects in computer usage, the impact on work organizations and work at home. Models and Theories of Human-Computer Interaction (9 chapters). User Interface Design (14 chapters). Individual Differences and Training (5 chapters). Applications of Computer Technology (6 chapters). Tools for Design and Evaluation (8 chapters). Artificial Intelligence (5 chapters). Psychological and Organizational Issues (5 chapters). Author Index (8,000 references). Subject Index (4,000 items). Editorial Board: W.E. Baker, T.K. Landauer, C.R. Marshall, T.P. Moran, R.W. Pew, B. Shackel, J.A. Whiteside. Contributors: H.L. Ammerman, L.Y. Arnaut, Ph.J. Barnard, H.S. Bashinski, F.D. Becker, J. Bennett, P.A. Billingsley, D.A. Boehm-Davis, J.F. Brock, J.M. Carroll, L.L. Chapman, M.H. Chignell, K. Crowston, B. Curtis, S.J. Czaja, S.T. Dumais, R.E. Eberts, D.E. Egan, J. Elkerton, K.-P. Fähnrich, C.M. Fligg, Jr., L.P. Goodstein, P. Goumain, J.D. Gould, J.S. Greenstein, J. Grudin, R. Gupta, M.G. Helander, K. Holtzblatt, M.G. Joost, J. Karat, W.A. Kellogg, D.E. Kieras, K.H.E. Kroemer, Th.K. Landauer, R.L. Mack, R.R. Mackie, R.E. Mayer, Th.W. Malone, T.S. Moody, W.C. Ogden, J.R. Olson, O. Ostberg, K.R. Paap, H.M. Parsons, G. Perlman, R.W. Pew, M. Phillips, K.M. Potosnak, J.H. Pratt, J. Rasmussen, Ph. Reisner, T.L. Roberts, D. Rosenberg, R.J. Roske-Hofstrand, E.M. Roth, W.J. Salter, R.J.H. Scha, J. Sharit, T.B. Sheridan, S.L. Smith, H.L. Snyder, L.A. Streeter, T.S. Tullis, W.L. Verplank, K.-G. Waern, J. Whiteside, J. Wilson, D.D. Woods, P. Wright, C.D. Wylie, W.W. Zachary, J.E. Ziegler.